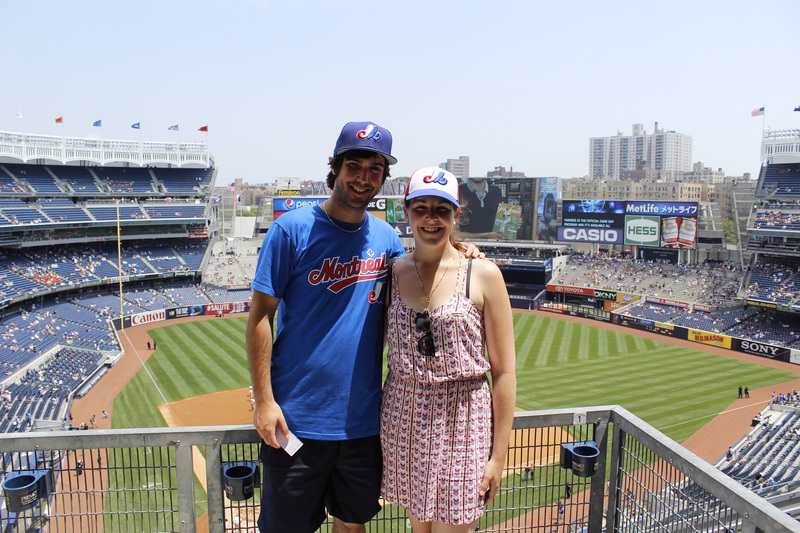 After leaving Fenway Park on July first, we slept a few hours to drive down to New York to go see the Yankees play the Tampa bay Rays at the Yankee Stadium. To se Fenway and the Yankee stadium in less then 24 hours is pour us one of the best moment of our life! In New York, we met up with Marie-Joelle Parent working for the Journal de Montreal ( Article in french right here ). 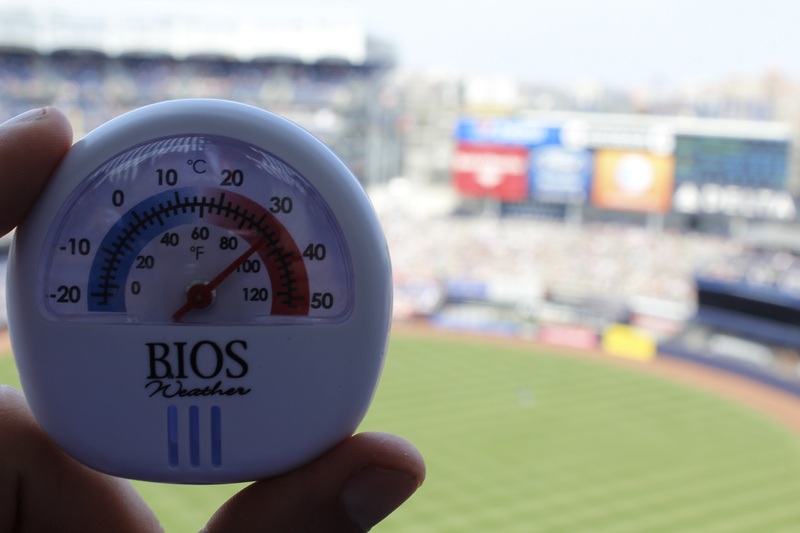 She interviewed us and walked us to the Yankee Stadium with an unbearable heat! 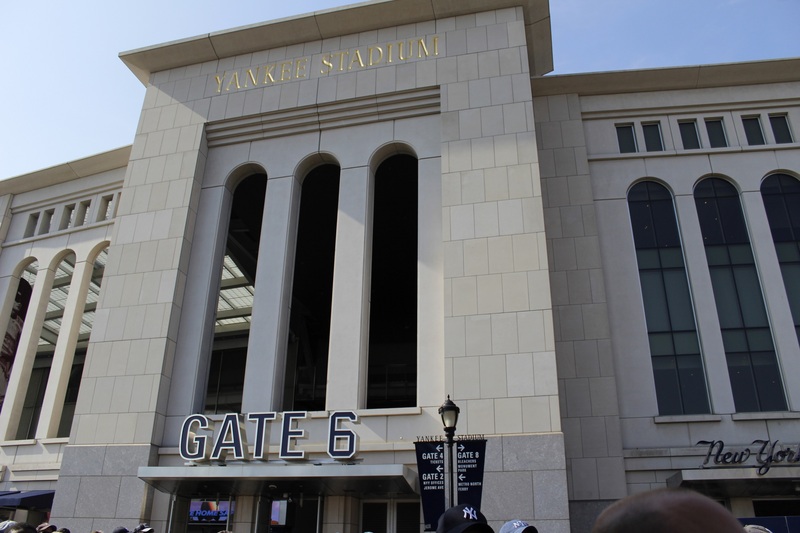 The new Yankee stadium is a really balance stadium.Explaining, we can find all the history and the old school baseball as much as the the new contemporary style. 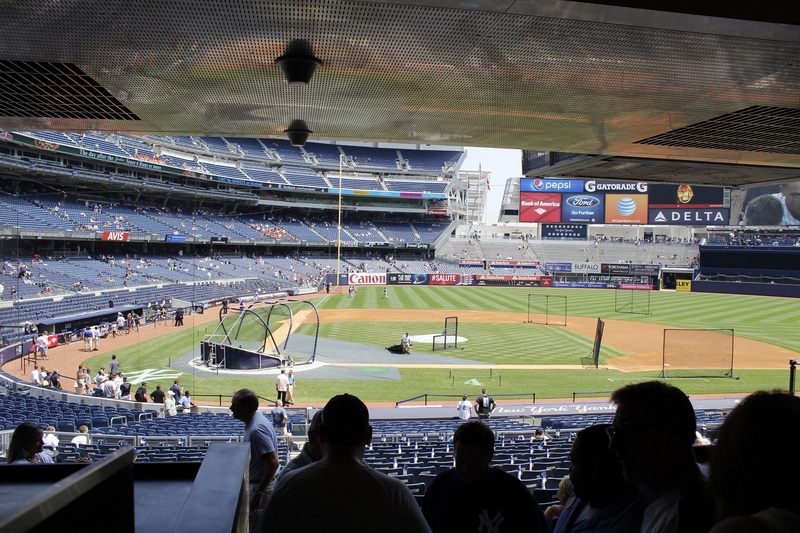 The first thing that we saw was that the stadium is really ”open” even when you are inside on the upper decks. Large walking paths and big openings on the outside let us breath easily. 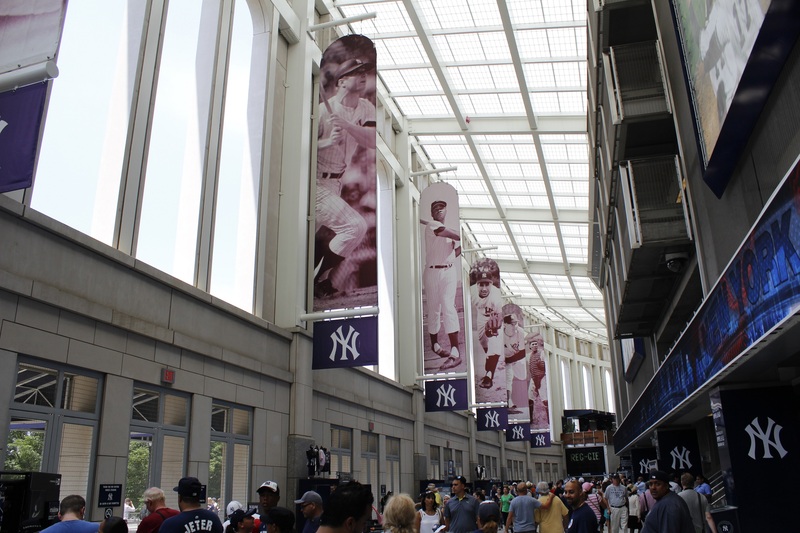 We can see all the great players that played for that historic franchise: Berra, Gehrig, Ruth Mantle, Jeter, etc. We feel the pride of the fans going back to the roots of the club, a pride that we can compare to the one of the Montreal Canadiens fans. s speech at the old Yankee stadium. What a great souvenir! 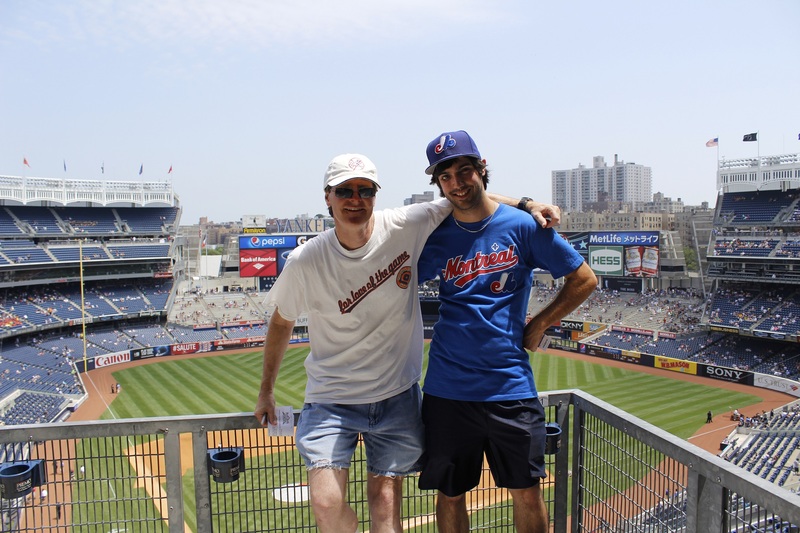 We then encounter Chris, a P.E teacher from the New York area that visited 23 out of the 30 MLB ballparks in his life. We talked a lot about baseball and hockey! (Chris is a Rangers fan and he attended the famous habs-rangers comeback in Montreal). Chris was really nice to us and we wish him good luck to on his missing 7 ballparks! We love when people come and talk to us because we are wearing expos gear, every baseball fan has a special story about the expos! We got lucky because our places in the Grand Stand were in the shadow. The thermometer showed around 90 degrees at our places! 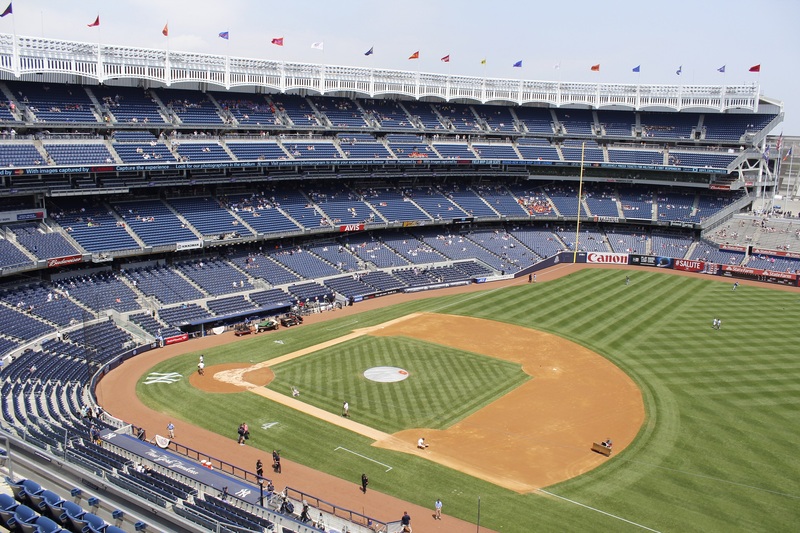 Even though, we realized that it looked like there were no bad seats in the Yankee Stadium. The people in the bleachers were having a blast and even from the last row of the grand stand you had a great view of the game. So many people trash talk about the Yankees and their fans. Yes the food is expensive (people in front of us payed 86$ for their meal! 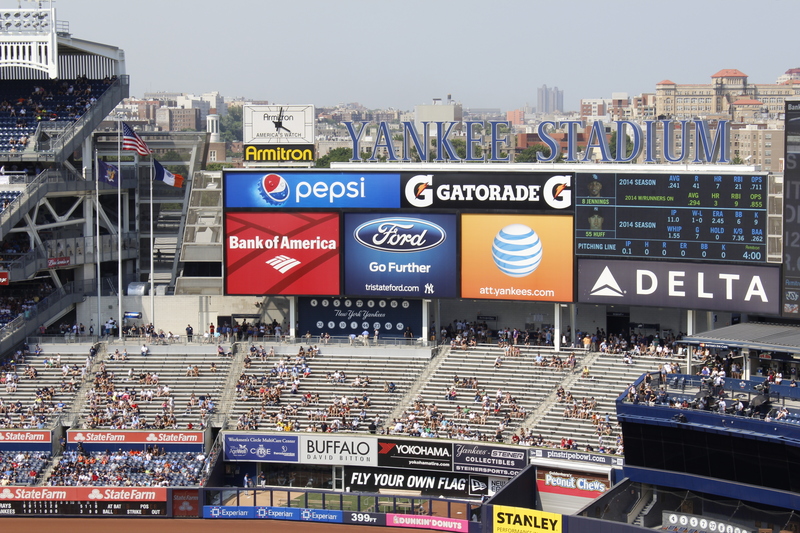 ), Yes the team offer players big contract to bring them to New York but when you are sitting at the New Yankee stadium, all of this doesn’t matter because of the beauty of the game and the ballpark. We got a good price for the tickets, people surrounding us payed attention to the game, even for an afternoon game with a high temperature! 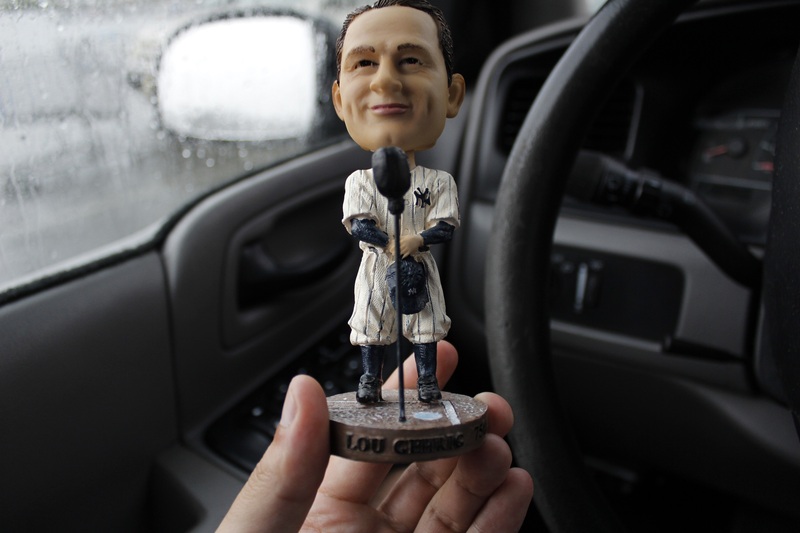 Our opinion about the Yankees is that they have to live to the rhythm of New York: everything goes fast, everything is expensive, people are impatient (not you Chris!) but when the umpire yells: Play ball and in the end you can hear Fran Sinatra singing New York New York, you understand that you are in front of 27 championships and a place that have seen the some of the greatest players in history! 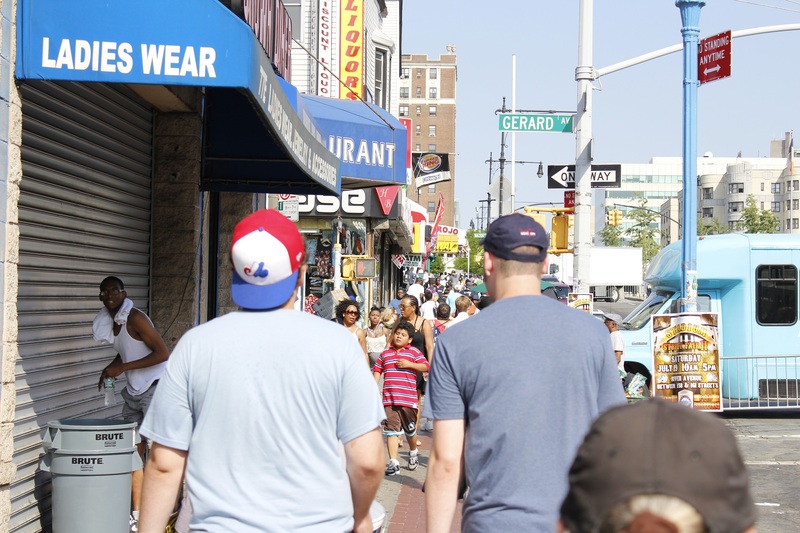 PS: walking New York we saw a guy wearing an expos hat! I feel it, the team is coming back my friends! Salut Gabriel, je suis un maniaque du baseball comme toi, je suis avocat à chateauguay et je suis un bon ami de ta mère età fanway park les 7,8 ton père. JE suis extrêmement heureux d’Avoir lu ton entrevue de marie-jeoelle parent dans le journal de Montréal du 3 juillet dernier et d’avoir appris ton départ malgré ce qui t’est arrivé au début de mai. Je te souhaite tout un voyage et de beaux match de baseball. De mon côté, je serai au Fenway park les 7,8,9,10 juillet. Mon équipe préféré les Dodger alors que ma femme supporte les Red sox et les White Sox. Celle là même qui m’a accompagné il y a 27 ans en Californie et assisté à 5 stades et 7 matchs de baseball en voyage de noces. Alors, tu peux comprendre pourquoi nous sommes dans la région de Boston cet été. Je souhaite du bonheur, de santé et surtout des blanchissages!!! Au plaisir de te rencontrer un de ces jours! Merci beaucoup pour vos bons mots! Je vous souhaites des bons match à Fenway et nous allons inviter les gens à nous rejoindre à Toronto pour notre dernier match de la tournée! Si vous êtes intéressés nous allons indiquer dans quelle section nous serons assis!